How is everyone’s week going so far? I’ve been getting a lot of things organized around the house since getting back in town, and it feels great to get back to a normal routine and be settled for awhile. Yesterday I did laundry, cleaned out and organized my closet (I do this every few months and either donate or consign! ), de-cluttered my desk, and tidied up my bathroom drawers. It’s crazy how those things can change your whole perspective and mood, am I right?! One of the major benefits of cleaning up around the house (and cleaning out your closet!) is making room for new things! While I did remove a things from my closet that I haven’t worn in a long time, I have also added a couple new pieces to my wardrobe this month. The first is this pair of earrings I snagged on sale (the sale pair I found sold out, but I found them full price here!) as an early birthday gift to myself. I’ve already worn them SO MUCH! 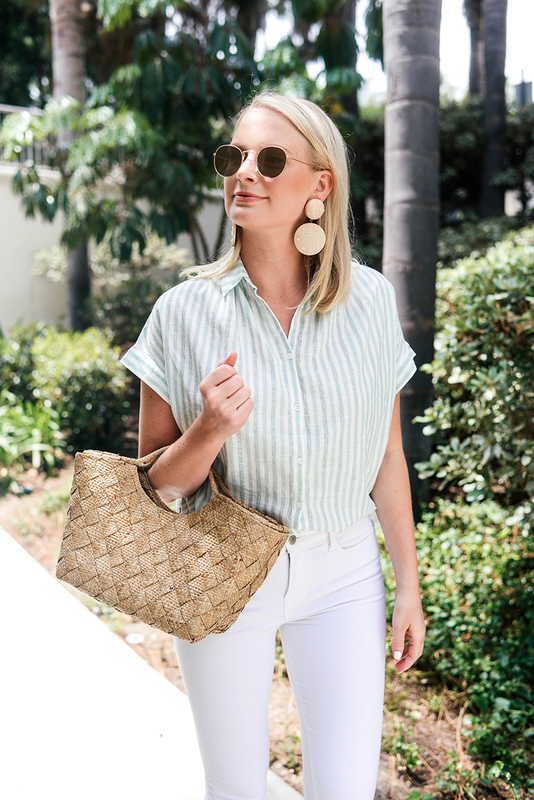 They are truly the perfect neutral accessory to wear with every color in my wardrobe, but they look particularly fabulous with white and softer colors. The same earrings I’m wearing are on sale in this brown wood too! I actually picked up that darker wood hue in this three-drop pair myself (also on sale!) – I think they’re going to look amazing going into fall, don’t you? If you love the look of these earrings, don’t miss this pair, this pair or this pair either! The other new item you’re seeing in this outfit is this cute and casual striped shirt. It’s not on sale, but it IS under $70! 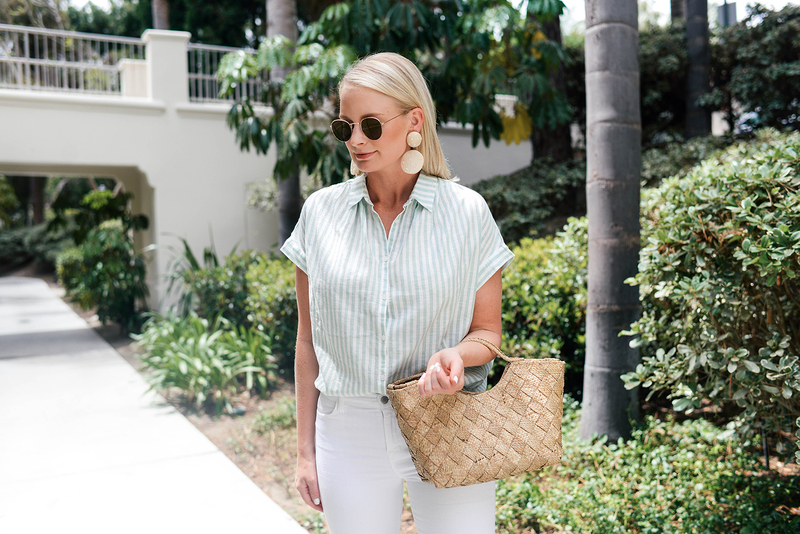 The pale green and white stripes is a nice little pop of color for my mostly neutral wardrobe, and I love the way it looks paired with clean white jeans (my all time fave pair!) and neutral accessories. A chic and easy daytime look! I’m wearing a size small! Love a good cleaning and love that striped Madewell shirt! I like the color of the stripes! Beautiful casual outfit! I love the sandals- the heel is the perfect height. Oh Chloé, you make such gorgeous shoes. 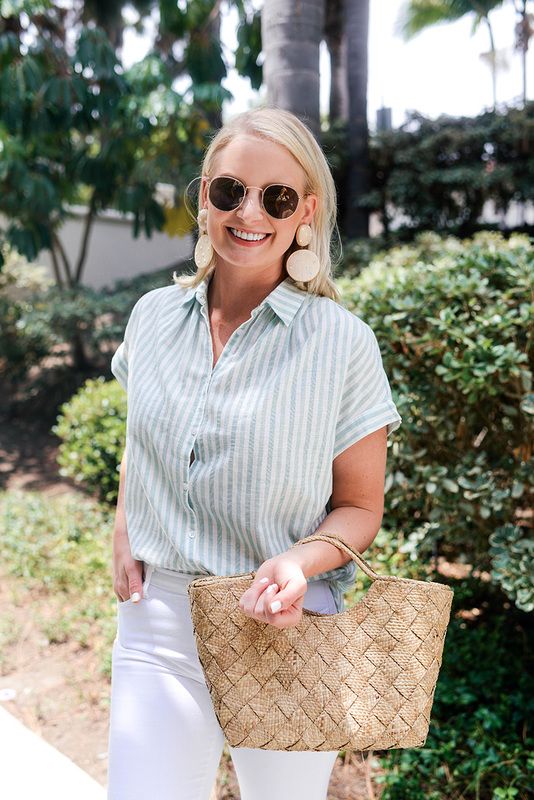 Such a gorgeous summer look, adore those earrings!